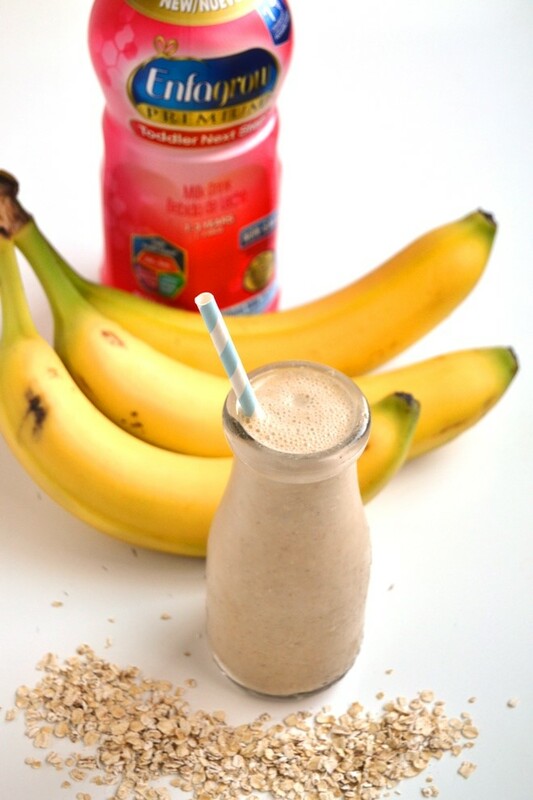 Kids Oatmeal Breakfast Smoothie is a nutritious smoothie for kids with bananas, oats, peanut butter, and a DHA milk based beverage-Enfagrow Toddler! As any mom, I truly want the best for my kids when it comes to nutrition. I am so lucky that Adalyn has always been a good eater from the start. As a dietitian, I have a pretty good idea of what foods that toddlers need, though we still struggle at times just like any parent feeding toddlers. Lately, at age 3, Adalyn has been struggling with eating meals. I know that part of the problem is that we are giving her snacks which sometimes, fill her little belly up too much before a meal. We are now trying to limit snacks close to dinnertime which seems to be our biggest struggle. If we do give her a snack within an hour or two of dinnertime, we try to stick to something light and nutritious like raw vegetables. Adalyn is still an awesome eater but some of those uncommon veggies are getting left on her plate. She is currently not a fan of mushrooms, zucchini, squash, turnips and beets. I cook some of everything though so we keep offering her these foods and hope that she will start liking them again soon. The morning is my favorite time with the kids. They are both happy for the most part and we get excited each day to make breakfast together. We have the same taste in breakfast foods and enjoy a sweet breakfast most days. 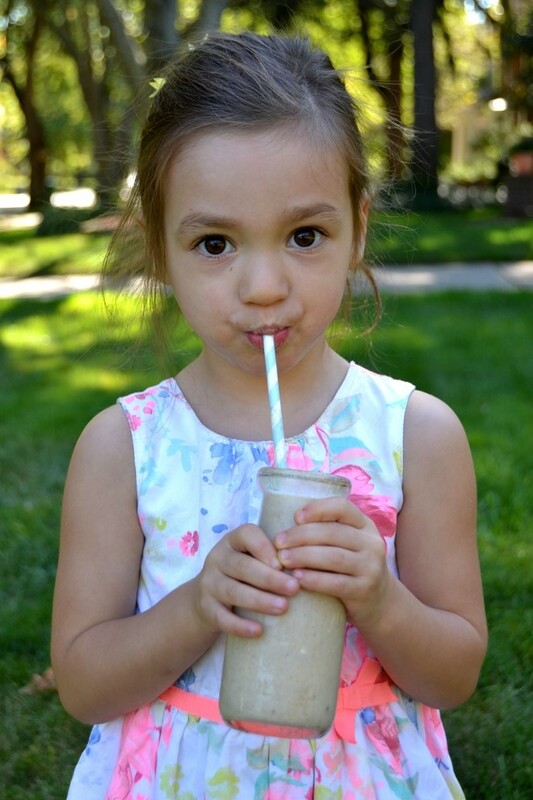 I made this smoothie for her to drink on-the-go on days where we have an early morning activity or school. While Adalyn mostly eats well, I do worry about her getting DHA since we do not eat much fish. I do give her chia seeds which she loves on her yogurt and in smoothies which are rich in omega-3 fatty acids. This beverage is kid-friendly and you know that your child is getting important DHA. This smoothie is perfect because it is totally kid-friendly and takes two minutes to make on a busy morning. I call it a breakfast smoothie but you can totally make it for your kids for a snack as well. If your kids can't have peanut butter, try sunflower butter, almond butter or soy nut butter instead. Whip this quick smoothie up and kids will be thinking that they are getting a treat! 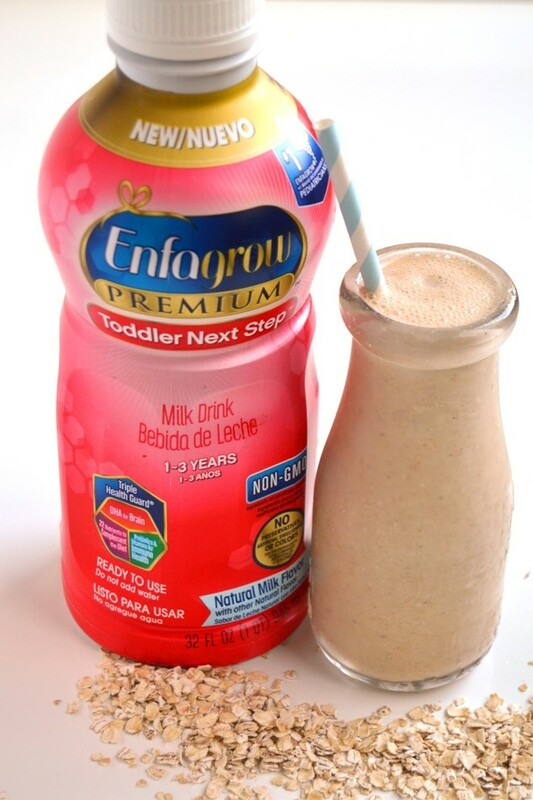 It is loaded with nutritious ingredients including bananas, peanut butter, oats and Enfagrow® Toddler Next Step™. What is this beverage? It is a milk-based drink for toddlers ages 1-3 that has DHA to help bridge the nutritional gap in a toddler's diet. For those picky kids who do not like a lot of foods, this drink has nutrients that your little one needs. During the first three years of life, there is a critical window of opportunity to support brain development and this drink can help. 85% of brain growth happens in these first three years. 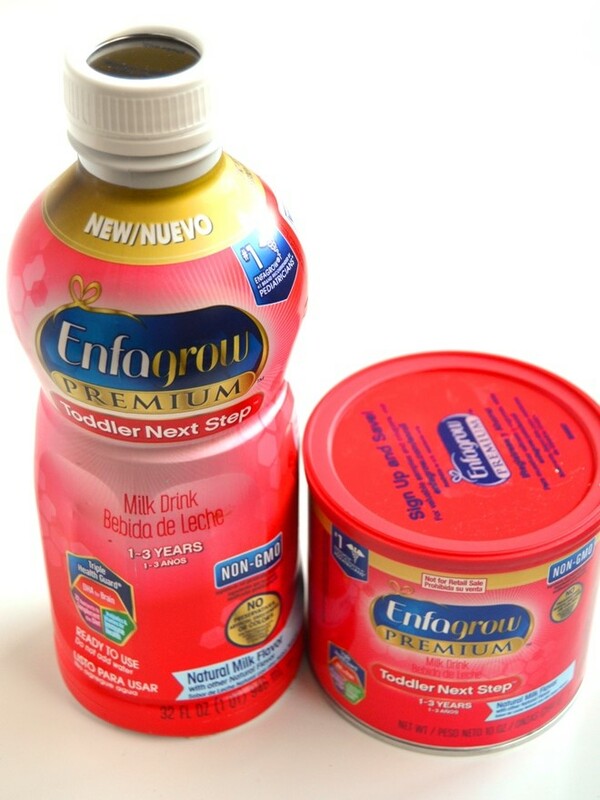 Enfagrow Toddler also has prebiotics which can help support digestive health. This drink comes in a powder and a ready-to-drink liquid. Did you know that on average a toddler's diet only provides 25% of the recommended DHA? It is recommended by experts that toddlers have 70-100 mg/day of DHA to support early brain and eye development. This drink can help bridge that gap! This drink works well in this smoothie because it is totally kid-friendly and takes two minutes to make on a busy morning. I call it a breakfast smoothie but you can totally make it for your kids for a snack as well. If your kids can't have peanut butter, try sunflower butter, almond butter or soy nut butter instead. Whip this quick smoothie up and kids will be thinking that they are getting a treat! Blend all ingredients together until very smooth. Enjoy!